Infect the Maulborn with their own plague. Scout Kanat says that the rest of the scouting party is dead or afflicted, too far gone to be saved. He also says the Maulborn are protected from the Llodos plague by arcane wards. Scout Kanat says the Maulborn are using wards to protect themselves from the plague, a gift from Vox. If those wards could be destroyed, the Maulborn will be susceptible to their own plague. The Maulborn dragged the rest of Kanat's scouting party deeper into the cave and infected them with the plague. Kanat bled himself with his own blade, rendering him useless to the Maulborn's efforts to create an army of plague husks. There are three Maulborn wards to destroy, located in the southern section of the cave. 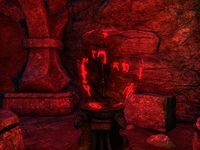 Head left from Scout Kanat, and destroy each ward located on three Daedric pavilions throughout the chamber. The one on the south pavilion is guarded by several Maulborn. The western pavilion is surrounded by many plague stalkers wearing Hlaalu armor; they must be Kanat's former comrades. The northern ward is also guarded by Maulborn. Once the wards have been destroyed, return to Scout Kanat to report your success. When you arrive, Kanat has passed, but Captain Diiril and Varon from Narsis are there in his place. Report to the good captain and brief him on what happened. In particular, he takes interest in the part where the wards that were protecting the Maulborn from the plague are now destroyed. Now they can be exposed to the plague. Captain Diiril asks you to destroy the crates the Maulborn were using to take the plague to Mournhold, and give them a taste of their own medicine. Destroying the crates will release the plague. Diiril plans to have his archers shoot the crates from a cliff. All you need to do is tell Naryu Virian when to fire and protect the archers. Naryu and the archers are located outside, at a pavilion on a cliff overlooking the gorge. Facing Scout Kanat's corpse, take the path on the right-hand side, slaying the Maulborn in your path. Tell Naryu when you're ready to begin the assault. She informs you that once the crates start breaking, the Maulborn will be on top of you like a pack of hungry wolves. The first wave consists of two Maulborn Recruits. The second wave consists of three Maulborn Recruits, and the third wave brings four Maulborn Recruits onto the pavilion to fight. Finally, Maulborn Commander Arvys comes out to face you alongside one recruit. Maulborn Commander Arvys: "You've doomed us all! Prepare to die!" After the archers have destroyed the crates, talk to Naryu. However, the plague is spreading quickly. I need to find and destroy three arcane wards in the southern section of the cave. I destroyed the wards. I should return to Scout Kanat before the plague spreads further. Hlaalu archers will try to destroy the cargo bound for Mournhold from the cliffs above. I need to defend the archers while they make their attack. I'll meet up with Naryu Virian to signal the attack. Finishes quest The crates filled with Llodos plague have been destroyed. I should return to the cave and speak to Naryu about our next move. This page was last modified on 14 April 2019, at 02:34.